What I did: made a batch of seeded wheat bread, modified from the Tartine Book No. 3 because I have no access to the “high-extraction wheat flour” they suggest. Who went with me: 19 came to the store with me. 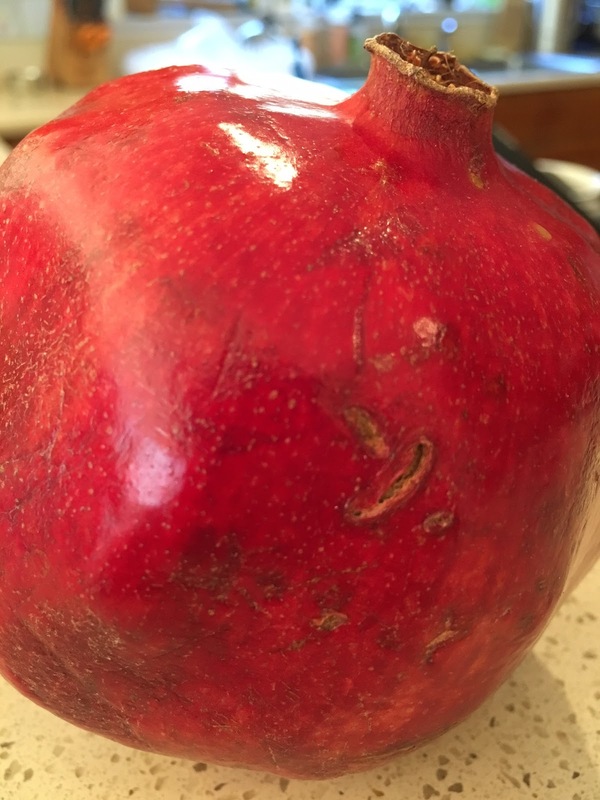 He encouraged me to buy a pomegranate and maple kefir. How I got this book: the friend who gave me the first Tartine book also gave me this one. Owning these two books has transformed my bread-baking skills, and revived my love of cookbooks. 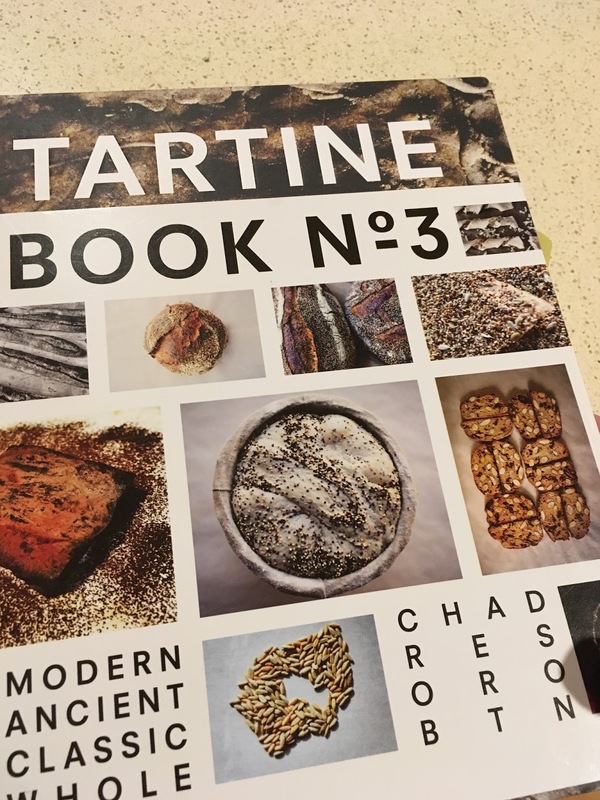 The first Tartine book has enough detail to take you from knowing nothing about baking sourdough bread to being something of an expert. Both books are beautiful. 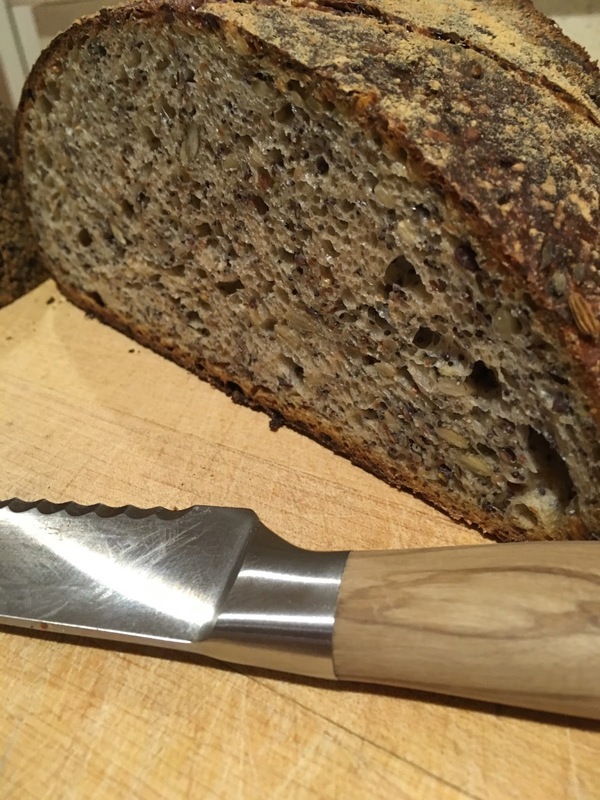 Why I baked this bread: I have made country sourdough loaves, traditional French bread, semolina bread, rye bread, sprouted spelt, oat porridge bread to which I added golden flaxseed, faro porridge with hazelnut bread, and smoked sprouted rye. This is the one people ask for. One batch makes two loaves and I take one to the barn where I ride. The seeded wheat bread stays fresh for days, makes yummy toast, and is delicious all by itself. Of course, it’s usually gone within a day or two, and everyone is very appreciative of it. Do I knead it: no. I make bread using the no-knead technique detailed in the original Tartine book. It takes longer. 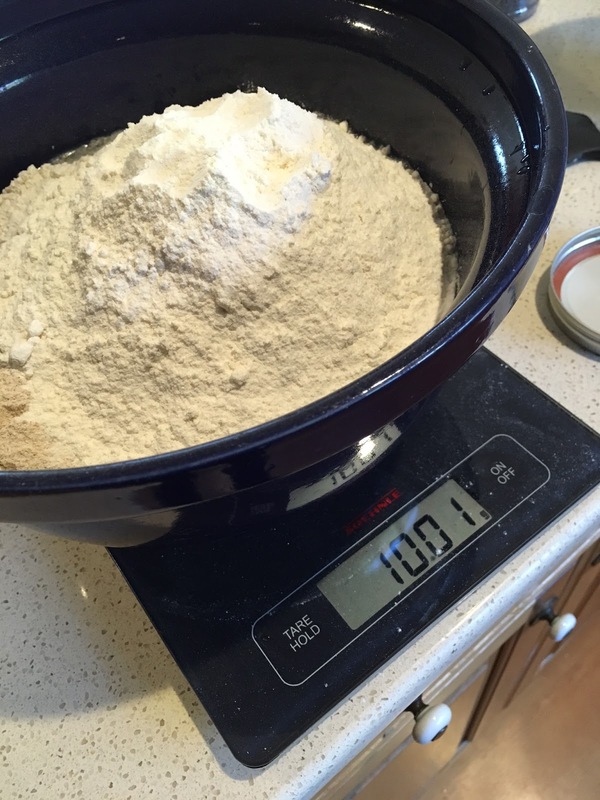 Sometimes, to get the leaven where I want it, it can take three days. It’s worth it. Things that were sad: once, I tried to make a joke about how the only reason people like me at the barn is because I bring them homemade bread. Someone at the table responded that that was a terrible thing to say. 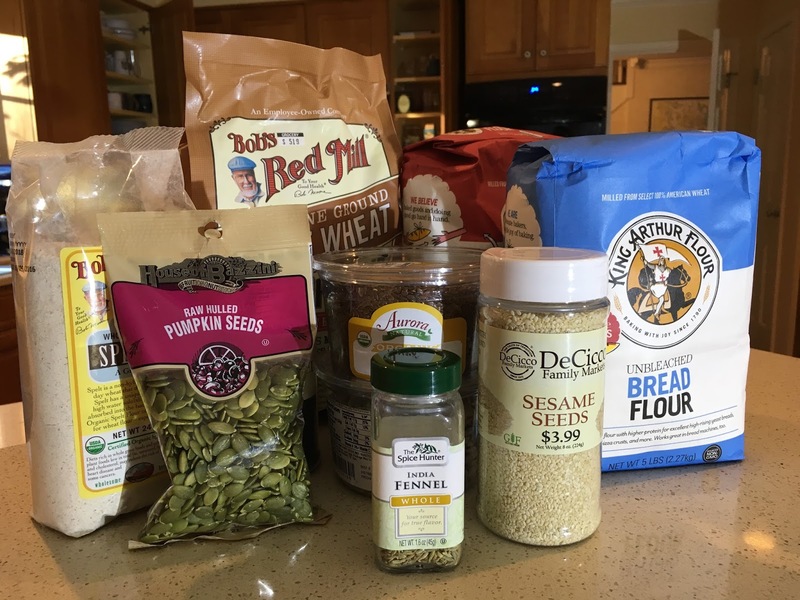 Things that were not funny: the recipe calls for caraway seeds and my local store never has them so I skip them most of the time. They need to be toasted, as do the sesame seeds. I use a 350F oven and try not to burn them and often burn them anyway. Things that were funny: I am regularly asked if I could make this bread and sell it. This is a nice compliment. I do not tell people that baking bread once a week is a pleasure, but baking hundreds of loaves every day sounds like a terrible nightmare. 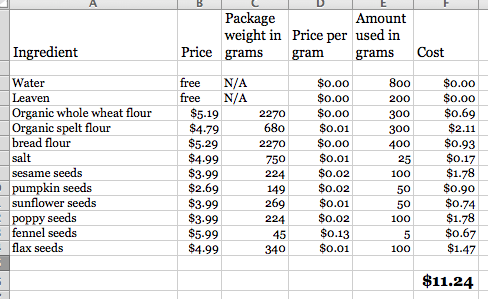 I also do not discuss the profit margins on fresh baked goods, or the cost of the ingredients, but out of curiosity I prepared a spreadsheet to figure it out. I did not include the cost of the homemade leaven (which is flour and water and whatever wild yeast I caught when I lived in Pine Box), my electricity, the cost of special clay baking pans, water, or my labor. Something I ate: while I did the turns, I paid bills, and met the surveyors who were staking our property line. I can’t seem to eat anything normal these days and while I had a salad a couple of nights ago, I’ve been doing things like eating a baked potato and a half a package of cookies and calling it dinner. That was yesterday. I am sick with worry about the future of this country now that it’s going to be in the hands of someone who didn’t know what a big job being president is and hasn’t read a book since high school. What it is: the way I make it, this bread has 11 ingredients, including water, salt and sourdough starter. I start with water, add the sourdough when it’s ready (it floats), and mix in the flour by hand. I leave this covered in the bowl to rest 30 minutes, then add the salt. At this point, I toast the sesame seeds and stir about 150 ml of hot water to the flax seeds. After another 30 minutes I add all the seeds except the fennel. Sometimes it seems like all the seeds won’t incorporate. They will. 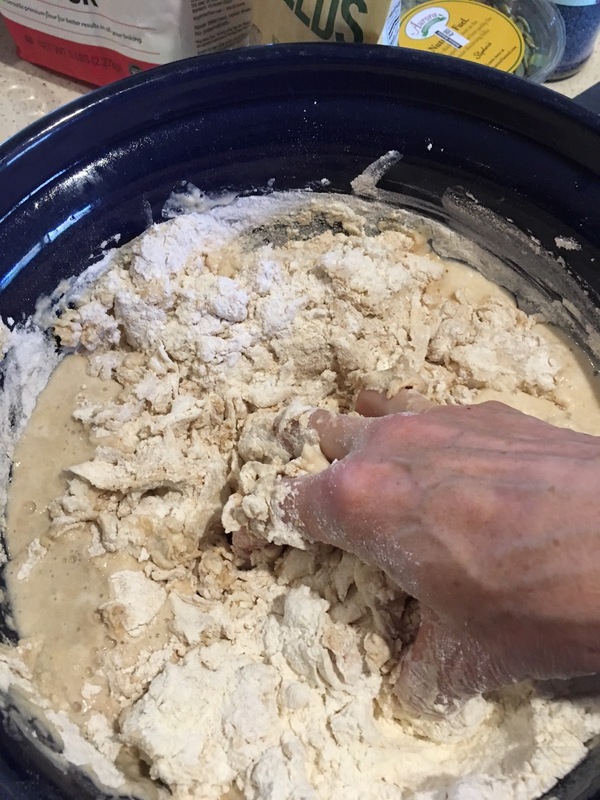 30 minutes later, I do the first turn, where you run your hand under the dough and turn it over, in three directions. Turns continue until I run out of time or the dough feels springy and stretchy, not just sticky. I turn it out on the counter, dust with rice flour, cut it in two, and shape these into round balls. 30 minutes later I flip them over, fold the dough lengthwise for the pullman pan or on all four sides for the round pan. I use the fennel seeds on the bottoms to help them not stick. 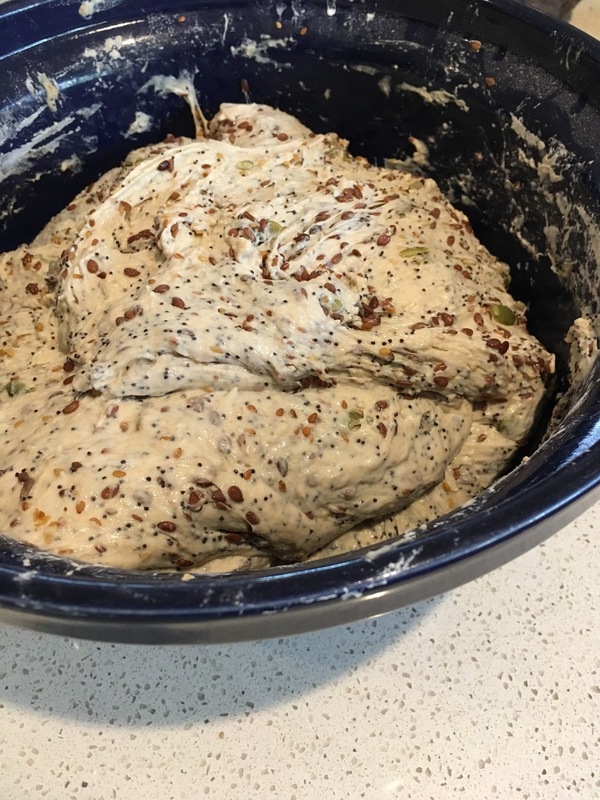 You can add other seeds to the outside of the dough, but I find that they get everywhere and don’t add that much since there are so many inside the bread. I put my dough in the fridge overnight, which is supposed to encourage the sour flavor. My bread isn’t especially sour, overall. I do this mostly for convenience. I preheat the ovens and the ceramic bakers at 500F. I slash the tops of the dough and bake them, covered, for five minutes at 500F; lowering the temperature to 475F, I bake them another 15 minutes. Then I take the lids off. This is my favorite step. I finish the loaves at 475F for 25 minutes, and cool them on a rack. 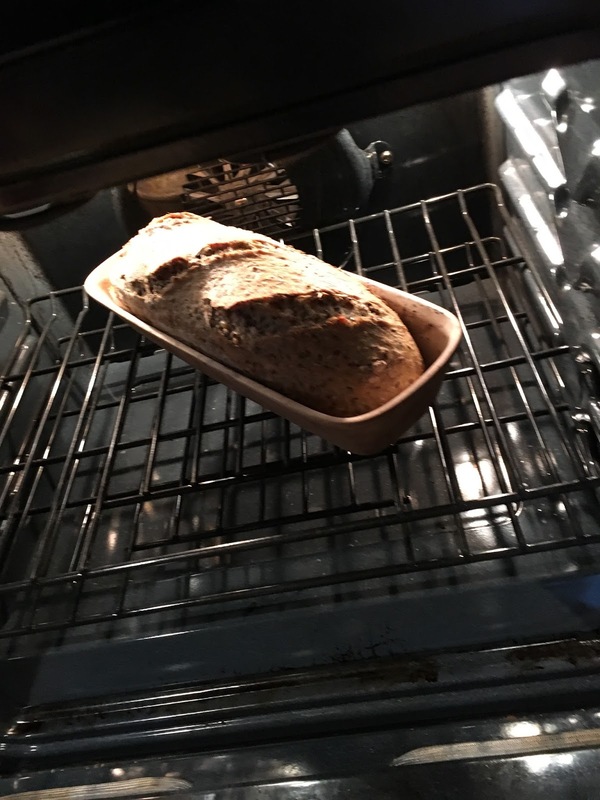 Who should bake bread: I started baking my own bread when we were renting a house in the country and the small town grocery didn’t have a good supply of decent bread. I successfully started my own sourdough starter, catching wild yeast from the air. In retrospect, this is surprising, since I can’t keep plants alive. Over the years my starter has changed in ways I’m not sure I have words for. The most specific thing I can say is it’s become more predictable. 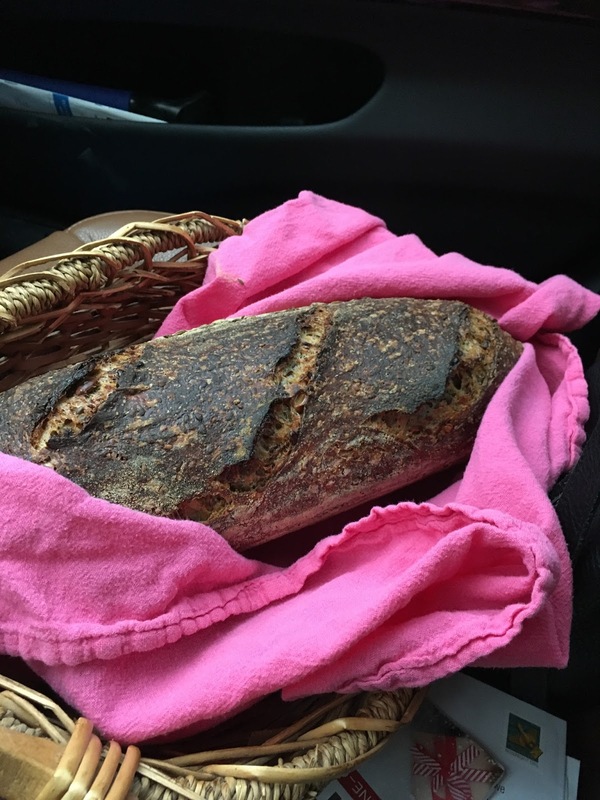 What I see when I deliver it: the barn where I ride is filled with hard-working people who wave and cheer when they see me walk in with a basket and a loaf of freshly-baked bread in a bright pink kitchen towel. It is my pleasure to make it.